The hemp plant has been used and cultivated by many civilizations worldwide since ancient times. People used to depend on the strong fibers of hemp to produce durable cloth in China and Turkestan. Hemp oil and seeds were also used as food. Only later was hemp used as medicine in Asia, while it took many more centuries for high CBD hemp oil to be recognized for its medicinal properties in the West. Hemp is a deeply misunderstood plant, since it comes from the same family (cannabis sativa) as marijuana. While the plants do share many similarities, it is the differences that make hemp so special. Just because two plants belong to the same family, it does not make them identical or even very similar. Industrial hemp is bred and cultivated so it contains far less THC than marijuana. Hemp is much taller when harvested than marijuana. The production of hemp does not violate the Controlled Substances Act. The most important of these points is that hemp naturally produces only very tiny amounts of THC, which is the illegal psychoactive substance in marijuana that causes a high.On the other hand, hemp contains quite a lot of CBD, which is a legal, non-psychoactive cannabinoid. High CBD hemp oil offers almost as many health benefits as THC-rich medical marijuana (if not more). CBD has been shown by many studies and continuing research to have many health benefits similar, if not identical, to those of medical marijuana products. There is also research underway to discover if CBD has any effects on curing cancer, asthma, multiple sclerosis and epilepsy. High CBD hemp oil, when produced properly, contains almost no THC and can’t possibly cause a high or any psychoactive effects. So there are none of the legal problems and side effects associated with medical marijuana. What’s the Difference between High CBD Hemp Oil and other CBD Products? CBD is simply CBD, no matter which cannabis plant you get it from. CBD is short for cannabidiol, which is one of the (more than 60) cannabinoids contained in most cannabis/marijuana/hemp plants. The difference lies in how much CBD every plant contains. Some cannabis strains contain very little CBD, making it almost ineffective. High CBD marijuana strains, on the other hand, might contain a lot of CBD but also contain a significant amount of THC. Since THC causes strong highs and is still an illegal substance in many states, high-CBD marijuana strains are a risky business. Hemp oil, on the other hand, contains almost no THC and more CBD than most other natural products. This is why high CBD hemp oil is the best choice if you want to try a non-psychoactive, legal product that contains little to no THC. There are plenty of shops online that offer CBD hemp oil, and it is possible to find similar products in medical marijuana shops in the states where they are legal. When you want to buy high-quality hemp oil, it is important to remember that deriving pure CBD from the plant is an expensive procedure. CBD oil is, thus, a pricy supplement. If you find a CBD product that is cheap, it is very probable that the product is impure or simply a scam. The best way to ensure that your high CBD hemp oil is pure and of high quality is to buy it from sources like our site, Health Hemp Oil, that offer reasonable prices. This is actually the fun part! CBD supplements come in so many variations and products that you can experiment quite a lot in the way you’ll consume them. You can simply ingest the oil as is for a quick and easy solution. For this purpose, it is smart to choose a nicely flavored CBD oil for maximum enjoyment. Vaping your CBD oil with a special oil vape pen is also an option if you prefer to inhale your product in the form of mist. Finally, CBD oil can be added to foods, drinks and sweets as a raw condiment and flavoring. Just remember: start with the lowest dose of CBD possible at first. 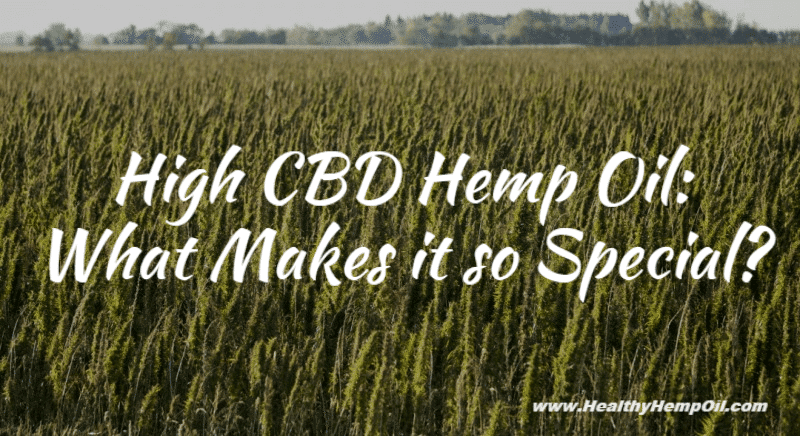 Do you have a question about high CBD hemp oil or anything to add to our article? We look forward to reading your reply below.